Scholastic just seems to know what kids like, and The My First Collection Vol. 2 Featuring Spoon is another hit. 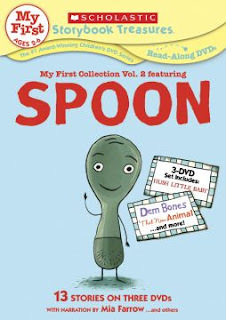 This DVD set includes 3 discs featuring: Spoon, Dem Bones, and That New Animal. There are 13 stories total with a run time of 127 minutes (plus extras). It is recommended for ages 2-6; however, I think the Dem Bones songs are great for older kids as well. -A Boy, A Dog and A Frog: Cute video (not cartoon) about a young boy and his dog trying to catch a frog. No words, just cute music. -Bugs! Bugs! Bugs! : Lots of color in this one. Still images and highlighted text. Disc #2-Dem Bones: Amazing disc that is perfect for anatomy lessons (Dem Bones) and history lessons (Erie Canal, dinosaur bones). Good for ages 4 and up. -Dem Bones: LOVE this one! Great song with highlighted words. The parts of the body are colored red on the skeletons when the song talks about them. We learned a lot of new facts about our bones! -Hush Little Baby: Still photos from the original storybook with highlighted text as it is sung (twice). -Fox Went Out on a Chilly Night: Still photos and highlighted text. A little morbid considering the fox is going hunting...so just be aware. -Dinosaur Bones: Great colorful images and highlighted text that will teach your little one all about dinosaur bones and paleontologists! -The Erie Canal: This story starts out with a quick history lesson (and real life photos) of the creation of the Erie Canal. Then, the story transitions into still images (cartoons) and a song about the Erie Canal that the kids really enjoyed! -That New Animal: Still pictures and highlighted text about a dog who is trying to figure out why this new animal is here (aka: the baby)! -I Love You Like Crazy Cakes: Adorable old story with highlighted text. -Smile For Auntie: Very old images with highlighted text. Not really a family favorite. -Blueberries For Sal: One of my favorite old stories complete with highlighted text. To find more Scholastic Storybook Treasures, like NewKideo on Facebook.